Omigosh, how cute are these guys? I’m a sucker for postcards. Big time. Love having them in all shapes and sizes. I have animal ones, nature ones, theme park ones, and ones with Elvis’s face on them. Babies playing drums, dogs in wigs…the list goes on. 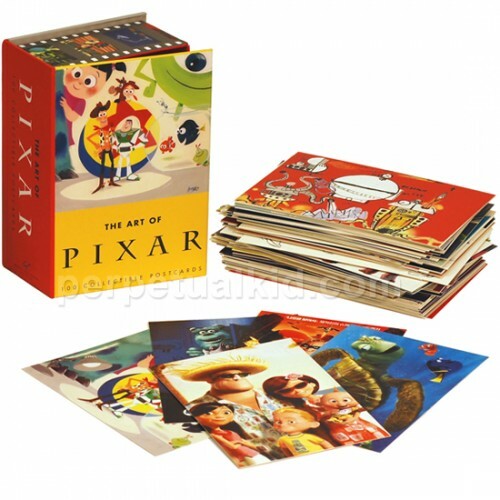 So I about went cuckoo when I found this big, ginormous box of All Thing Pixar in Postcard Form over on Perpetual Kid. All of the postcards are sketches and art from features and shorts Pixar did from ’95 to ’05. I can’t wait to plaster them all over my office: happiness, served via cardstock, daily! Plus, Perpetual Kid is offering 10% off orders of $15 or more when you enter code SPRING at checkout. Score! Check ’em out by clicking here! This is so clever! And you even gave us a discount, how fantastic!